Adorable house/cottage in Chicorua Ski & Beach Resort on private lot surrounded by trees. Sit out and relax on the sandy beach of the meticulously clean and spring fed Moores Pond (only a Three minute walk). The private roads make it safe to walk or bike ride around. Enjoy sitting outside by the fire making smores or having a cocktail. Feel free to atv or snowmobile in our 40 acres of trails right near our front door. Other amenities offered are basketball ball court, tennis court and playground for the kids. This property is newly remodeled and new to the rental market. There are new queen beds, bedding and new living room furniture. Comfortable and cozy. Plenty of room for the 3 of us. The house is located in a small resort neighborhood. It is quiet and off the beaten path yet close to anything you will need during your stay. The place is very clean. Furniture is comfortable and it is all well laid out. It is not very big but was very comfortable for my family of 3. I will certainly stay here again if available as I am in the area a few times a year. The owner was very easy to get in touch with. She was very responsive. 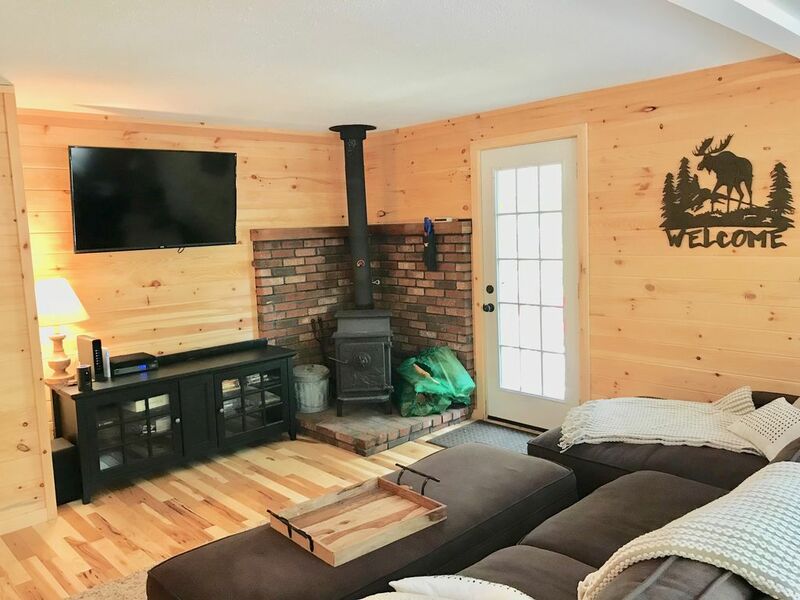 The cottage is super clean and comfortable. You can tell it was taken care of to ensure the guests were comfortable. Great bed and linens. Everything you need in the kitchen. The place looked and felt brand new! And it’s very quiet!! On the plus side, the place was cute, very clean and very quiet. Bed was comfortable. Easy parking is right in front. But there were a lot of little details missing that would have made our stay better. Putting the street number on the house would make it easier to find. The shower is plumbed backwards so you have to turn it to C for hot water and H for cold water. Not a big problem but a small annoyance. Most rentals have a book with instructions for the TV, local attractions, how to lock up and check out - but we couldn't find any such book. When we returned to the house the first time, we found we had left the door unlocked. There is a process to lock the door but we hadn't realized that and had to figure it out. All small things but when you're on vacation they are annoyances. Having a few pages on the kitchen table would go a long way to making they place more enjoyable. The house was clean and exactly as pictured. It was the perfect size for my family of four! We can’t wait to go back!! The pond was awesome it was a 2 min drive or 10 min walk, it was clean and perfect for our kids. Very clean renovated cottage and the owner was extremely receptive when we had questions. We enjoyed using the fire pit and the beach area is great. Will stay again!